Sanity prevailed. But what if it hadn't? Idiots! At the age of 9 I used to take the bus to downtown Los Angeles and go to the LA Library. Took about 1 1/2 hours and 2 transfers. Easy. At the same age I would ride the train (solo) from San Bernardino to Union Station in Los Angeles. Fun! This is it; the last day of the calendar year. A year that I do not want to ever see again. A year where the only positive note came from the election of Barack Obama. As gratifying as that was, it doesn't erase the damage done to our society by Bush. That may take decades and I'm not sure that I have time for it. But, all of that aside, people will be celebrating tonight as the calendar year 2008 ends, just not me, the new year that I am looking forward to begins in 20 days. Sure, but will it find my glasses for me? I just read Bob Herbert's op-ed piece (Previous post) for the New York Times and although it was a rehash of all the failures of Bush, stuff I know far too well, it was still worth reading again. And then I think…where were these critics when Bush was running for president in 1999? In 2003? Why was he elected in the first place? And then re-elected? He hasn't changed at all. He is still an idiot… and a criminal. Can we send him the bill? Please! What's new? Nothing. Here it is, the last few days of 2008 and I'm having a problem finding anything to write about. I'm bored! I could write about the financial crisis but it's so depressing and there's nothing really new or positive to mention. The weather is boring. Bush&Co are boring, still doing the same dumb things and getting away with it; for now. Great! I tried to shut it down and that was when a window popped up with the message that, 'Word has experienced a problem…' and it would look for a solution. Of course 'it' never got back to me so I had to use System Restore to restore the computer to its previous configuration; the one before Microsoft meddled with my settings. And, yes, everything works as it should now. *Study…it's actually a spare bedroom. But we always wanted a Study or a Library. Maybe we will call it the Library next year. Here's what I'm thinking… since the satellite and cable providers refuse to do ala carte television; I can get almost the same thing for just $5 a month. Netflix gives you most of the popular television shows you might want via your internet connection. As many as you want and some are even 'same day'. And if you don't want to watch them on your computer monitor screen, you can do a little bit of cabling or even a wireless connection and have it shown on your big screen TV. Sure beats $50 a month! This morning I was reading that today is the anniversary of the Massacre at Wounded Knee. And I was thinking… It should be part of our history lessons and taught to little children. Really. How do we ever expect to change our behavior unless we know what's wrong and what's right? And learn it early in life, before our parents have a chance to change history to better suit their own ideas. Here it is; another day that will never come around again. Make of it what you will. And so far it appears to be very much like the previous one. Meaning? I have no idea, I'm just warming up my typing fingers; both of them. I did have a thought… we received our annual Christmas letter from Julia and Art and really enjoyed reading of their adventures during the past year. And then I thought about the fact that Christmas cards appear to be fading in popularity. A few more stray thoughts and I came up with this business plan; perhaps a new career! You've heard of Life Coaches? Professionals who help you make the important decisions in life? Well, I'm thinking about Life Editors. Professionals who will help in presenting your daily life to the world in the manner that you deserve. The Life Editor could work with you all year long and then, sometime in November, present you with the complete Christmas Letter. With some imagination, it can only get better. A single, year end, consultation (30 minutes) would be included in the cost of the lowest priced publication (Additional consultations at $50 an hour). For the premier edition, you would direct your client throughout the year. Your client might call and ask, "Should we do the Darlington 500 NASCAR race in April?" Your response: "No. That's out. Absolutely!! I think a museum trip would be more in line with the image we are working toward." You meet the happy family at the museum, take a few pictures, record a few comments. Edit. See? It's easy! And since it's my idea, I will take a small percentage for my creative genius…say 10%? Good genes I guess… all of our children and all of our grandchildren, from the youngest to the oldest are musically talented. They can all play (and do..) iPods! I do love technology. High technology. This morning I read an email with an attached photo of my grandson and his dad. No big deal for technology, but a very big deal for Kyle (and his dad!) 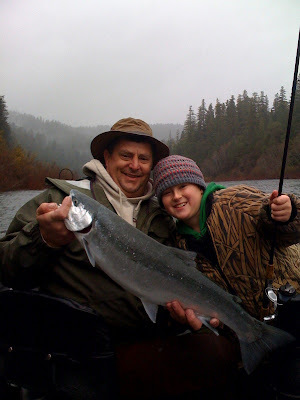 as the photo was taken and sent from the Smith River and my grandson was holding his first steelhead. But that wasn't the big surprise… it was the fact that AT&T was able to do it. Around here, they are lucky if they can deliver a signal from house to house on the same block! You know, I think I could spend the whole day here. What's not to like? Images and colors. Are Retirees Breaking Their Social Contract? I was browsing as usual and ran across this little gem. Now I need to see if I can get a copy of the book at the library. I'm not sure that I want to spend $$ to read what I believe I already know. Here, On the Planet Orland, there seems to be an excess of elders. I could be wrong; it might just be the fact that I spend a lot of time involved with the Glenn County Seniors Centers, working as a volunteer board member. It's enjoyable work, but the most frustration comes from the fact that the majority of the elders I come in contact with are resistant to change of any kind and most are quite comfortable with the thought of living out their lives in the twentieth century. Ack! But, on the plus side, most are also resistant to the idea of retirement communities. Those Republicans are SO funny! And mature. "The problem, he said, was not that Americans spend too much, but that foreigners save too much." White House is so confused! Christmas traditions are dying fast these days; except on the Planet Orland, of course. But… since Christmas is relatively new, I see no reason why it shouldn't be on its way out. The celebration of Christmas was forbidden by the Puritans and Santa Claus didn't show up until the twentieth century. So, yes – it's time for a change! And then there was my sister's Christmas dinner menu… Halibut! With a side of Dungeness crab and shrimp cocktails. She knows how to celebrate Christmas! With the exciting days of summer all but forgotten, politics are simply a drag once again. We are on standby. And hoping that President Obama can revitalize the nation. And California is certainly in need of inspiration. We're stuck with a 'smoke and mirrors' governor and a spiteful minority of Republicans that are doing their very best to bring the state to bankruptcy. That governor; what a joke! I know we don't pay him anything and that further illustrates the fact that 'you always get what you pay for'. I really think the fact that he doesn't take a paycheck creates a mindset; an altered version of reality where this governor believes he is far removed from the needs of those he governs. After all, we're not paying him, so what allegiance does he owe us, the taxpayers? So, I'm thinking... why would you spend $$$ for a Kindle or $$$$ for Sony's reader? Or are there two separate markets here? A netbook with digital paper capability sounds like the answer. Christmas. It's over until next year and except for the retailers, I think we're all pretty happy with season. By mutual agreement, family gift giving was restricted to the children. For ourselves, we agree on one gift to be shared and we may buy it in April…or October. It depends on when it fits our budget and this year we are getting a television. In February. The old set is almost 21 years old and the sound system is shot. That, and the picture size decreases over the time it's on. See, I'm trying to justify the expense and that may be hard to do as we don't have cable or satellite and if we wanted to, we could always watch movies from Netflix on our computers. So why are we buying it? For the Wii of course! 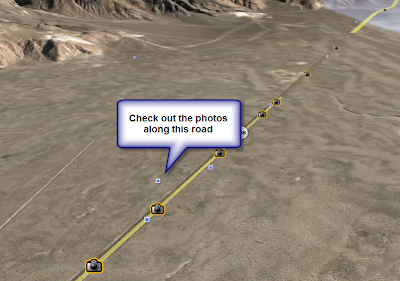 I've been having an awful lot of fun with Google Earth recently. I've been going around the country and putting 'push pins' on all of the places I remember being at one time or another. It's a great way to bring back good memories and all for free. It's also a good way to keep up with the news. I homed in on the Denver Airport yesterday after reading about the crash there. No, Google doesn't have live satellite views, but the view they have reminded me of just how remote that airport is and I could imagine how the passengers felt as they descended from the burning plane. I would have been surprised if the passengers could even see the terminal! Let's see, I was 'flying' over Lower Twin Lake yesterday. I think I'll go to the campground at Buckeye Creek this morning. And I need to visit Overland Park, Kansas this morning as well. And how about Disneyland? Sure. Cabo San Lucas? Why not! The spammers have a new tool. They turn the address header around and you receive spam that looks like it came from your own pc. The senders name is 'me' and so it comes through the first of the filters. Google is able to stop it before it gets any further, but it's still irritating. The spammers are really clever people and the only thing that will stop them is to reduce their profit. There has to be a way! Cool! As soon as I wrote that last sentence, I Googled 'stopping spam' and came across this article… just like I said. But, look at the date on the article. Sigh. Isn't this cozy? Wind and rain. OK, it's not much of a wind; yet. And the rain is only a mist; so far. But it's supposed to get downright wintry around here sometime today. And we will be cozy. Guaranteed. Boo the Cat is in a winter mood this morning and has already taken to her bed on the bottom shelf of the small table here in the study. We only did one round of cat wrestling before she decided to hit the 'snooze button'. The Dorset Naga... it's addicting. Really! "What we need are more troops in Afghanistan because we need security, and eventually we will get a strategy," said Roger D. Carstens, a former Army Special Forces officer who now is a senior fellow at the Center for a New American Security"
Eventually? Excuse me, but I thought 'strategy' would be the first thing you needed. And one strategy that these 'fellows' always forget is that when you take away the poppy crop, you have to replace it with something else. Time and time again, promises have been made to the farmers and each time the promises have been broken. So they go right back to growing poppies. I'm very much a creature of habit, despite my stated desire to always remain open to change. And 50 plus years of drinking coffee in the morning is not a habit easily broken. For the past two weeks I've been drinking tea at this early hour and this morning my body was telling me to open the can of coffee instead. My body whispered, 'just do it.' But I didn't. Now, with my second cup of tea in hand, I'm viewing all of the familiar websites, looking for inspiration and finding none. Maybe it's time for a change. Or a vacation. Can we afford a vacation? If we can find some free space among all of the various medical appointments, we should try and get in a short road trip. A change of scenery and a break in our routine could do wonders for our wintertime ennui. Boring statistic: Our 'new' car has close to 7,000 miles on it, it's 7 months old and it's never been past the Butte/Glenn counties borders. Or…did we go to Plumas County once? Whatever. The point being; if I can't even remember where we've been, it's been far too long since we made a trip. I suppose this sudden desire to plan a road trip could be because the recent epidural injection has made me more comfortable. Will it last long enough for 100 miles? 200? We should try. Now, how far is it to Monterey? The good old days? I think we have become a little better at decorating Christmas trees. The Year in Review, Tom Tomorrow Does it Again! And the prices are almost uniformly up by $2. Let's see… it's 10:45 and we're safely home. Not bad! We're already back from our shopping expedition and it went very well. Into Penney's in a flash at 8:30 and back out by 8:50. Now over to Toys R Us for another brief visit. Ten minutes at the most. But, I must admit that the experience had me worried. There was no one in Toys R Us. The clerks outnumbered the customers by a ratio of 20 to 1? You could have grabbed a skateboard and skated down any aisle with safety. Has Christmas been cancelled? We also visited Bed, Bath and Beyond and World Market. It was the same story. 10 in the morning and 3 days left to shop; you'd think there would have been a few more people. ps… While I was waiting for the good food to arrive, I opened a copy of the Chico News & Review and read the Anthony Peyton Porter column from last week; a good one! I was just reading about President Obama's vacation trip to Hawai'i and reflecting on the fact that it will probably be the prime vacation destination during his presidency. How cool for Hawai'i! And the press corps has to love it… sure beats Crawford, Texas for a destination. But, I also had to think about what this does to my long held belief that America needs to give Hawai'i back to the Hawaiians. I know that there are those that say we should keep it because we stole it fair and square. And steal it we did. It was blatant. And ugly. I've always entertained this thought that we, as a nation, might have matured enough over the years to a point where 'right' is more important than 'might'. Probably not. It makes sense to be up early this morning. We have a mission to accomplish and so we will be out and shopping at an early hour. The earlier the better! Truth is, this is shopping the way I like it. Very early and no crowds. The clerks are more than polite and the shelves are full of bargains. It doesn't last, and by 10 o'clock the swelling crowds will have destroyed the charm of these early morning expeditions. But, by that time we should be through with our shopping and on our way out the doors and back to the safety of our car. If we didn't find what we wanted, we'll do it again tomorrow. Or the next day. We're only looking for a couple of presents and some bargains to store away for another time. I don't think it will be all that difficult to accomplish. Oh yes…one other thing. We'll be looking for a Christmas tree to replace our old one. The old one has seen its glory days come and go and it's time for a change. For this year it is still doing its job of course, lovingly decorated and looking quite glorious as long as you don't look at it critically. Squint. Google Earth did it again... took me right to our hotel in Hilo. A great place... no telephones or television at the time we were there. Apparently, they now have television, but I see no phones in the photos and no mention of them. But we all have cell phones today, don't we? What fun! I started off with a Google Earth trip to the windward shore of Oahu because I wanted to see if I could remember anything about Kailua... that's where our next president will be vacationing. I didn't see much, but I don't think we did much more than stop at the grocery store when we were there many years ago. So I 'flew' over to Kauai to see if there was anything there to jog some memories. And there it was! We spent a few nights at this great little hotel and for very little money. We had the 'penthouse suite' for something like $90 a night. And it's right across the street from the lush Marriott resort where rooms started at $300. Take the photo tour... it's awesome! The penthouse? It's right above the Garden Island Inn sign. The bottom line? "If we had wanted to preserve the Big Three, we would have bought more of their cars." And we didn't. Is this the first day of winter? It is. How appropriate. It certainly looks and feels like winter around here. I know; what am I complaining about? We live in northern California at an altitude of only a few hundred feet and winter cannot be all that bad. So you say. We have lived all up and down this state, from the beaches to the mountains and have experienced all sorts of winters and I can truthfully say that I didn't care for any of them. And all things being relative, winter in Orland is just as bad as winter in San Diego, even though 600 miles separates us. So I was listening to Science Friday yesterday and although I didn't hear it all, what I did hear was interesting - as usual. One of the more interesting segments dealt with Social Media in 2008 and a thought or two about where it's going. Part of that story was about, "The PC is dead; long live (some other device)!" I'm still of the opinion that the PC will be around for a very long time, despite the rise in cloud computing. There was also a prediction that the various social media platforms will soon be able to 'talk' to each other seamlessly. Twitter and Facebook do that right now. The only thing that is slowing down that integration is the fact that we're so far behind the rest of the world in internet connectivity and speed. I think I heard that we are 15th… or 16th. Sad. That fact makes me even more aware of just how tenuous our leading position is in science. I have this bad feeling that some 'yahoo' Senators and Representatives will do their best to kill any appropriations for the advancement of science. Now is the time to fund the exploration of space and new technology, not spend the money on funding another few months of GM/Chrysler hawking trucks to us… Can you say, 'The Dark Ages'? OK, so I'm in a snit again. Wow! This is so weird! If you tweak the 7 statements... just a little bit, this would describe teenagers! I have an idea! What if buying a new car caused you to become bankrupt; would that qualify you for a Federal bailout? Or this; buying gas for your car caused your bankruptcy? It was all about cars, wasn't it? "memories of the Bush years, of the war in Iraq, congressional corruption, and above all, the trillion-dollar meltdown will require years to fade." How many years are in 'forever'? What else did I see in the news? There was a story about Israel warning Russia to not sell weapons to Iran. Irony. (Or 'Irany'?) I would have the same reaction to that story if it were the Brits or the Chinese or the USA. How dare any of the world powers pretend that they aren't guilty of perpetuating war by selling weapons? They all are. Israel sells weapons all around the world. As does Russia, America, France, Great Britain, China, etc, etc. The so-called 'civilized' nations…guilty. "But folks, why do we politicize prayer?" Because prayers in public are not prayers at all...they're politics. Duh! Darn! I missed the boat. Yesterday, when I was upset about Rick Warren being chosen to deliver the invocation at President Obama's swearing in ceremony; the fact that Mr. Warren had preached in favor of Proposition 8 wasn't on my mind at all. It was the fact that Mr. Warren is a politician. He is also the leader of a large club or organization. I'm afraid I haven't been a fan of Mr. Warren for a very long time and for reasons that have nothing to do with his stand on human rights... And if Mr. Warren has any sense at all, he will withdraw from the ceremony. I'm not expecting that to happen. The headlines continue. The incoming president has made his first error as far as I'm concerned. He has chosen Rick Warren to deliver the invocation at his swearing-in ceremony. He's another one who has used his pulpit(s) for political purposes and I would much rather see a person of faith giving the invocation. But, hey! It's his invocation, not mine. Of course that subject leads to this… taxation on churches. I'm for it! Especially so when the pastor's are intent on playing politics. I'm a member of a church and it seems to me that if I'm also a responsible member of the community at large, I should be willing to pay my share towards the community services I enjoy. Just a thought. I must go see the dentist early this morning, so I'm supposed to be caffeine-free. No tea for me! I will have to use hot water and honey to energize myself. Maybe the headlines will wake me up? The first headline was not a headline. "Chrysler Halts Manufacturing". If my memory serves me right, most auto manufacturers used to idle their plants at this time of year. But then I read more of the story and came across these reassuring words, "A disorganized failure, disorganized bankruptcy or disorderly bankruptcy ... could cause great harm to the economy, beyond that which we're now witnessing. And that concerns me," Bush said. "And the other point is that, I'm not interested in ... really putting good money after bad." Asked when he will decide the auto question, the president replied: "I'm thinking through, you know, it needs to get done relatively soon." Best I can tell, Bush is on top of things. A voice of reason and assurance. We won't have any disorganized failures if he has anything to say about it. Then I read Time Goes By for this morning and was reminded that the headlines are not telling the stories that really matter. Stories of ordinary citizens who haven't had the luxury of an 'organized' financial failure. Maybe I need a nap? I just had this really great brain 'Surprise!' thingie. What if the guy that was throwing the shoes the other day was really Osama in disguise? Hey! It could be. After all; do you know where Osama is? I thought so. I've always been a fan of this particular place on the planet. 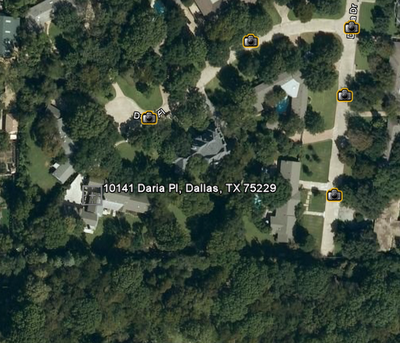 So this morning I took Google Earth out for a spin and found that lots of people have been there. And taken photos. Back in a former life, I always thought I could live out here quite happily. The Sierra's to the west and the White Mountains to the east. And a whole lot of space in between! No, I'm not a salesman. But this is good! I come back to Shorpy half a dozen times a day, just in case there's another masterpiece like this. View it enlarged for the full effect. Do I want to read the news this morning? Or should I just hide out in Facebook and browse the latest Flair? It would be so easy to do just that! But the day beckons and I must face reality. Yikes! Blagojevich? I sound like an idiot when I try to say it. Whatever. The story isn't his name but the fact that it is likely that he didn't break the law. Sure, he's a jerk and 'ethical' and 'moral' are words that he can't pronounce, but so far it appears that he hasn't taken a dime. He simply talked about taking that dime. And politicians are allowed to do that. It actually helps them to be re-elected - in some mysterious fashion. That's something that ordinary mortals will never understand. According to my inbox, Christmas is imminent. The retailers are hitting me with all sorts of spectacular sales offers. So many that you might swear that the holiday was only a few hours away and I was in danger of losing my soul for eternity if I didn't buy something…NOW! "Dr Kunar reckons that having to think about responses during a phone conversation competes for the brain's resources..."
Back in my other life, when I worked, I had a hands free phone and would sometimes end the conversation and then look around in bewilderment; how did I get here? A few minutes of conversation had erased all memory of the drive. Did I go through any stop signs? How fast was I going? According to what I see on the Caltrans cameras, it's snowing all of the way down to Applegate this morning. "and his shoes were being held as evidence, said the official, speaking on condition of anonymity." Yes, officer...I saw them. They were 10 EE in a light Cordovan color and they needed half soling. Every time I hear the 'poor mouthing' about taxes from the Right Wingnuts, I get incensed! With over 70% of the major corporations' paying no taxes at all…shouldn't we all be incensed? Criminal! And Detroit needs what, $30 billion? Ah, chump change! "GM sold 444,000 automobiles in Brazil from January to November. This is a 10.4% increase from the same time period last year." A quiet morning for me. I haven't even looked at the news! But I will… In the meantime I got involved in writing something for my Working blog and then I was using Google to find people that I remembered from the time I was writing about. Which I did. You have to love Google! What else… I did finish the book, Blood Meridian by Cormac McCarthy. Whoa! If you are at all bothered by violence, don't read the book. If you love the written word, be sure to read it. McCarthy is poet and author and he can string words together beautifully even when they are savage. I've read four of his books now in the past few weeks and I need to find another one. And as I began another book last night, Boo the Cat took up her usual place, stretched out on my lap and legs. And after awhile, I was inclined to shut my eyes…to better meditate upon what I was reading of course. When I opened my eyes, I beheld a royal purple cat! Not entirely purple; just those sections of her fur that were reflecting the light in some mysterious manner. As I stroked her back, the color would change from dull black to a dark purple. Wow! I shut my eyes. I opened them and poor Boo was her ordinary self. Still lovely of course, but she really did look good in purple! But, what caused that? If you have ever been around an all-black cat, you know that their fur can appear to be reddish brown in a certain light. So I assumed that the Ott light I was using to read by had affected my vision in some way. So I closed my eyes, leaned back and 'meditated' some more. Sure enough, when I opened them I had my purple cat back! It's that time of year! Snow! Pick the highway location of your choice and watch motorists battle the elements while you stay warm. Truckee at the scales was inoperative this morning and Truckee at the Ag station was minimal due to lots of snow on the camera. Try the junction of 29 and 88 for a nice view. "'DUE TO BUDGET CUTS, THE LIGHT AT THE END OF THE TUNNEL IS BEING TURNED OFF.'" "'Being a Republican myself, I feel very betrayed by the Republican Party right now,'"
"We have 5% of the world's population and now use 60% of the world's drugs. That's certainly not winning this deadly war." Some current news… In a shift, the White House said on Friday that it would consider using money from the $700 billion financial bailout to help automakers after the Senate abandoned a rescue bill. OK, I'm divided on this. This is not a White House to be trusted. And although the ethics of our House and Senate members is suspect; I think I would trust them first. And if no one helps the automakers, what kind of suffering will occur? There will certainly be some until another company takes over the plants and resumes production. Which will happen. And we really need to put aside any feelings about national pride here. GM, Chrysler and Ford are all multinational companies with plants and labor on all continents. They fly the 'money' flag. I'm so confused! But not about the money; Dubya shouldn't have anything to do with it. The attack of the Invisible Hand! Temperature: 34°F | Humidity: 89% | Pressure: 30.04in (Falling) | Conditions: Clear | Wind Direction: ENE | Wind Speed: 4.0mph | Forecast: Mostly sunny in the morning then becoming partly cloudy. Areas of fog locally dense in the morning. Highs 54 to 62. Light winds becoming south around 10 mph in the afternoon. The morning rolls on. And as I read the headline stories about the erudite Illinois Governor Blagojevich and his lovely, soft spoken wife, I was reminded once more of why it's so important to never link your name or reputation to a political party. I'm so grateful these days that I chose to become independent. I may be a lot of things but at least I'm not a Republican/Democrat. If you read the roll call of recently newsworthy and corrupt officials, you will find Democrats and Republicans in equal measure. Do you think, just maybe, that it's the power and not the party? Either way, it's best to avoid any alliance with a political party. Bozos! Though I do like the idea of having a second airport in the region. Sky Harbor has to be seen to be believed! OK, so where is Dudley Do-right when you need him? In case you were wondering how it (the financial crisis) all happened. As expected, the usual suspect, Ronald Reagan played a huge part in it. Any good news today? yes, the price of gas has gone down and that makes it less expensive for you to get to work and back. Oh? You don't have a job anymore? 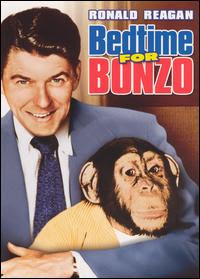 Bonzo? He's the one on the left. The right? Whatever! A kinder, simpler time...? Check out the story about the 'masquerader found hanged' and tell me if you think it was suicide. What were they thinking? Most humans are addicts. 99.9% It's how you manage your addictions that is important. I was watching a guy at the doctor's office yesterday. He sat nervously in the waiting room for just a few minutes and then he had to leave. He was outside on the sidewalk and lighting up. Another addict. And when he was finished, he came back in and we all recoiled at the tobacco stench he brought back with him! I was lucky; they called my name just then and I was able to leave the room. Poor Laurae was stuck, though she debated on going out to the car or not. Not won. She suffered through it. I was searching for an article I had read about Governor Richardson and I stumbled onto this one...it's good reading, all about my favorite state. (Hawai'i is second) Now I must go find that article! I just had an idea. A great idea for a website. If you've ever shopped for a new or used car, you might have used Edmunds.com to determine the right price for that vehicle. 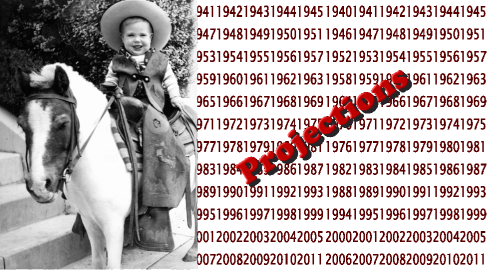 Edmunds calculates it based on where you are; your zip code. Prevailing wholesale prices in that area are used plus a markup for the dealer. Voila! The fair price is…. So why can't we see something like that for healthcare? Appendectomies in Zip Code 94123 are Fair Priced at $7,450, including 2 days at the hospital of your choice within that Zip Code. Price includes all applicable taxes and 90 day warranty. Extended warranty is available for additional cost. Medicare pays 80% and the following approved supplemental insurers pay the remainder. List follows. But first; we need to decide whether we want healthcare to be improved or not? I think it's obvious that we didn't want it to be in the past. How else would you explain to anyone from a different planet, the mess we have? And it should be a simple yes or no. Not a 'yes, but…' kind of answer. If you are at all like me, your mind gets overwhelmed when you view the healthcare mess. Medicare, Medicaid, Insurance, Doughnut Holes and more. It's time to get back to basics here! And it shouldn't be my job to get it done. Or yours. Not with over 500 elected representatives paid to do those things for us. Where are they and what have they been doing? A sample of my gripes: I was using Google the other day to see if a certain medical procedure was covered by Medicare and if so, how much of it was covered. How much would I have to pay? Gosh; that seems like such a basic need for any wise consumer. But no, not with the tools that are given to that wise consumer. Almost every source of government information was a .pdf file; not the easiest document for a computer novice to navigate. If you selected the right document; a big 'if', you had to do a search within the .pdf to find the search term you were looking for and then you could only imagine the context once you found it. Since I used to teach people how to use their computers, I had an advantage and found part of what I was looking for in about 10 minutes. But it was only a small portion of what I needed and useless without the rest. And I was tired of waiting for Acrobat documents to load…so I quit. Here's a movement to get behind no matter your age! Since reading is what I do these days, I'm glad I found a reliable and prolific author; Dean Koontz. He is an entertaining author and a skilled craftsman in the writing game. He won't write a Nobel Prize winning book, but he will let you escape from this world for hours at a time and you will enjoy the trip. If his writing reveals anything of his character and personality, I bet he would be fun to talk to. I've finished his Odd Thomas series of novels and once more I'm reminded of why I don't like some series. The author has to describe the protagonist at the beginning of each book. But after the first book, I already know him! OK, it's a minor thing. Maybe they should have a version just for those who already know all about Mr. Thomas. Another chilly day. And the first thing I see this morning, after turning up the thermostat, is a blank screen on my computer and the log-in screen on the other. Yes, Microsoft has been here and gone; updating our computers. Unfortunately, my computer doesn't play well with the 'jump' drive I have and when it's plugged in during a reboot, the pc freezes as soon as it sees the jump drive. I have to pull the jump drive and start it up the old fashioned way. Isn't technology grand! I know that somewhere out there I can find a cure, a fix for this failed relationship between jump drive and pc. But do I really want to go through the hassle? And I have a similar problem with my ATI video driver; every time it loads it asks me to notice the fact that it can't find a certain .Net file. A file with an impossibly long name. I click OK and everything seems to work? Now ten years ago I would have enjoyed this kind of detective work. I did enjoy it! But I have matured and now I just expect things to work; the first time and every time. Sigh. And now...the rest of the story! On a different subject altogether; I used to watch our finances, as they related to the DJIA, on a daily basis. I have an Excel spreadsheet to chart the advances and sometimes the declines in the stock market. I don't bother doing that anymore. I haven't looked in days. Why bother? OK, I know, I know…I should be grateful that I have something to watch, even if it is going down in value. After all, we knew it was a gamble, right? No; that wasn't how it was sold to us. I remember the word 'security' being tossed around during those early days of investing. Hucksters in 3-piece suits and we fell for it. The big story this morning has to be the bankruptcy protection filing of the Tribune company. That's 3 major newspapers all at once. These are strange times indeed. But what's a newspaper to do these days? Remember the old quiz, 'What's black and white and red (read) all over?' And once upon a time the answer was 'A newspaper'. Now, if you ask that question you will get a blank look in return. Circulation is down and ad revenue is in the pits. If any of the newspapers want to survive into the mid-century, they will need a new business model and if I were an executive of a major newspaper I would be talking (Pleading) to Google or Microsoft; maybe even Adobe. I would be asking them to invest in the newspaper and then to re-invent it for me. On another but related subject; I have to wonder how much less paper is being used now that newspapers are cutting down on their orders? Is it millions of tons per year? I would imagine it's substantial. And that means fewer jobs. The ink industry? Another job 'hit'. Billions spent to bailout GM/Chrysler would be better spent on a thousand small businesses where there is a real peril of employees losing everything if the business fails. And strangely enough, as I was reading the Economist this morning, the editors made the plea for the nations of the world to use bold new ideas when it comes to thinking of ways to ease our current crisis. One of the ideas? To use some of that 'Bailout' cash to renegotiate loans where there is imminent danger of a business going broke. Gee! It seems to make sense. Yes, keep people working. America is a funny place. All the good rightwing conservatives insist that we should stand tall as Americans, shoulder to shoulder, as we demonstrate to the world our solidarity and patriotism. Until one of us need a helping hand. No, not my wallet! "but they have just given us this book, which is empty,""
A good article on why war of any kind won't change anything in this poor country. Someone with 'common sense' needs to fix it by helping the people with the simplest of things. A road. Electricity. We could do it and for a lot less than it takes to buy a dozen tanks! Speaking of writers, as I was… I've just finished the second book (The Crossing) of The Border Trilogy; written by Cormac McCarthy. This is good writing! But…you have to be able to endure sentences that can run on for the length of a paragraph. True, I really didn't see a place for a comma when I re-read one of the longer sentences, but I was really looking for a place to take a breath. I needed a comma! All the Pretty Horses is the first book and it had my attention all of the way through it. The Crossing had some of the best writing I've ever enjoyed when the author describes the hunt, the capture and the eventual death of the wolf. Moving. But then the book bogged down for a bit; understandable after the wolf story. Eventually it came back to being a good read. The last book, Cities of the Plain, is open to the first page. I can hardly wait! I was reading the Chico News and Review yesterday, my favorite Friday morning read, and after finishing the first few pages, I turned to the back page where Anthony Peyton Porter has a column. OK, it wasn't a new column, it was reprinted from 2006. But it happened to be one of my favorites. He has caught my thoughts perfectly when it comes to the subject of 'pride'. Now Mr. Porter is not one of the most popular columnists in town, though he is one of mine. He writes to make you think and not to be simply entertained. A lot of people don't like that. I've disagreed with him many times and sometimes I find his vulgarity bothersome…but he makes good points with his writing. There's supposed to be local frost this morning and I'm sure of it happening here. Along with dense fog, it makes for a gloomy morning. It would be a good morning for a fire, but I have to replace the seal around the door on the woodstove first; a messy job. Signs of the times… went shopping for essentials yesterday and noted that real 'cut' Christmas trees were selling for $20. All about 6' tall and really quite good looking. Full and fresh. And on our way out of town, noted that the Christmas tree lot on the corner of East Ave. and Hwy 32 is only about half the size it was last year. Sign of the times. China has decided to NOT loan us any more money. Yes, they said that our lack of regulation for our financial institutions had made us unworthy of credit. So no more Chinese investment cash until we get our financial house in order. I wish I could do the same thing with our taxes. Sigh. Now that mortgage is due in 2012; wouldn't it be wonderfully ironic if he couldn't come up with the payments and had to be evicted? Oh well, one can dream! Did I miss this one? I've been to the dentist and as usual, it was painless. But what is weird is the time compression that occurs while I'm asleep. Or not asleep, really. I hear things and I answer questions. But I don't remember much of what went on. This dentist uses IV Deep Conscious Sedation with the use of the drug triazolam. It works and time flies! I didn't have a conscious fear of dentistry, but… except for one dentist, many years ago, I've never looked forward to the visit. Was it fear of pain? Maybe; I do know that having any major work done now without IV Deep Conscious Sedation would require some bravery on my part. Our new car has had some problems. More than once we have come back to the car and found the front seat windows rolled part of the way down. Not a lot, just cracked a little. The other day though, they were all of the way down! Unknown to us was a feature? that allows you to press the 'unlock' button for 5 seconds and the windows roll down. Why? I haven't a clue. So my best guess is that I have been leaning against something while nearby and that action pressed the button. It's a guess...but a good one. So here is a possible fix. Oh, what a terrible morning! I have dental surgery scheduled at 8:30…which means that I can't have any coffee till much later in the day. I have a cup of hot water and honey in front of me, but it's a poor substitute for a cup of coffee. The surgery doesn't bother me at all, but the lack of caffeine is inhuman. Truth is, I have been trying to slow down my caffeine consumption recently and have switched to tea in the mornings. The coffee pot has been unused for the past 4 days now. What difference will it make? I'm not sure, but it seems like a healthy thing to do. And looking at the news… I see that we (Americans) have been far too wrapped up in our own domestic problems to even notice our neighbors. Canada is experiencing a domestic crisis of their own. Maybe more than one; their Conservative party, led by Prime Minister Harper, is trying to suspend the government for a period because it seems things aren't going their way. That would bother me. Anytime I hear about a 'conservative' messing with the government, I'm naturally suspicious. Financially, there is definitely a crunch because almost all of those fancy American cars and trucks have their beginnings in Canada. When we stop producing vehicles, Canada suffers as well. After I changed our ISP I thought I had changed all of the addresses on Blogger that sends me a note when someone comments on a post. But I forgot one... Short Laps. So I found them today and I've fixed the mail address...sorry. A good one this morning. And if I were to suggest something for these three, it would be to go on the road. A trip across America. I'm having a hard time getting myself going this morning. The thoughts are muddled and infrequent. I'm reading the news out of habit and not for discovery. I've almost finished the book, Obscene in the Extreme. And now I see why I'm fascinated. The author, Rick Wartzman, was the co-author of the great book, The King of California. That was a book I read at least twice as I read and re-read almost every chapter. This new book tells of the power plays by the Associated Farmers and the Kern County Board of Supervisors as they tried by word and deed to quash the effects generated by the Steinbeck book, Grapes of Wrath. This was in 1939, just one year before I was born. And as I read it I was dismayed by the great number of people that were all in favor of censorship. They believed it was in the best interests of our society to regulate what could be read. And last night I was thinking of how grateful I am to my parents for teaching me that censorship should be fought at every level; but most importantly at the personal level, that no one had a right to tell you how or what to think. Yes, I've been suspicious of 'authority' for a very long time and ultimately I've been proven right far more often than wrong. Way to go, mom! Our parents weren't militant liberals and we were never indoctrinated as if we were in some cult. But we listened to their conversations. Without television, a lot of conversation starters came from the newspapers. Or newspaper. Los Angeles and the suburbs had three papers to choose from and our parents chose the Daily News. Mom was not about to allow a Hearst paper into the house and she didn't have much use for the Chandler family either, so the Times never made it to our breakfast table. The book describes the events of 1939 and 1940 and the years leading up them, but it's still a very timely book. Big agriculture/corporate farming has not changed over the years and they still oppress their labor in search of more profit for the stockholder. But now they do it remotely, by dealing with 'labor contractors' so they don't have to get their hands dirty with labor issues. "'It took me too long to recognize that we had abandoned our American values and defiled our constitution.'" Now that's an American! With a conscience. Finally! We will really see the 21st Century...it's about 8 years late but better late than never. Click on the Agenda tab on this website and see what's been promised… submit your views. Imagine a President asking for your view on anything. I just started reading the book, Obscene in the Extreme by Rick Wartzman. A true story of how an important book came to be burned in public…in America. When fascists want power, that's what they do; ban books. I know I have been ranting lately about fascism but only because I believe we have more to fear from fascism than we do from all of the other 'ism's' combined. Because fascism always comes wrapped in a flag and disguised as patriotism. And we are especially vulnerable to its message when times are tough. Like now. The headline, "Stock Market Plunges as Recession is Declared" baffled me completely. Were some people in doubt? Were there financial 'experts' still wandering around with smiles on their faces and hope in their hearts? Oh please! I believe that those of us who are living life as ordinary mortals knew we had a recession a year ago! Bozos! An odd thing about the download; I downloaded (20+MB) from Download.com and after I installed the program and ran it, I got a message that an update was needed. Yes, another 20 MB and the whole install routine again. But it was worth it. Dear Senator; can we have a law like this? Please? If you enjoy history, here's a good place to read about it... I especially enjoy reading the 1938 editions of the paper and wonder; what were they thinking? "The party belongs to McCarthy and his heirs -- Rush Limbaugh, Sean Hannity, Bill O'Reilly and Palin. It's in the genes." I'm checking my email and I have a lot of it this morning. Hmmm. Cyber Monday? Are they crazy? I have a feeling that the on-line community is a little bit smarter than that. Or I hope so. The prices are going to have to come down, way down, this year to attract on-line buyers and dressing up a pig and calling it 'cyber' won't make it any less of a pig. Am I mixing my metaphors here? And I have read some articles that make me think we're seeing a big shift in the culture; people are deciding that Christmas doesn't have to be on the 25th of December at all. More and more are waiting for the after Christmas sales. What's a poor retailer to do?